Facebook or Google plus for a local business? A local business serves customers in a limited territory. For example, think of florists, plumbers, optometrists, dentists, restaurants, notaries, etc. For these businesses, is it preferable to use Facebook or Google Plus? I use the expression “Web Marketing” to describe the use of the web for the promotion of products and services. The mission of Web marketing is to increase revenue by acquiring additional customers and by increasing sales to existing ones. It is done by the careful selection of investments in the components of the web marketing mix. In 2011, I came to realize that ads on the Google search and display networks were quite cost effective in bringing qualified leads to a website. So I started to study Google AdWords and to read books about it. I was encouraged by my friend Jonathan Villiard, an SEO and AdWords specialist, to obtain my certification. I followed his advice and early this year, I passed both the Google AdWords Fundamentals Exam and the Search Advertising Advanced Exam. Passing the two Google exams made me an AdWords Qualified Individual but that was not enough for partner status. I had to manage over $10,000 of advertising in 60 days. 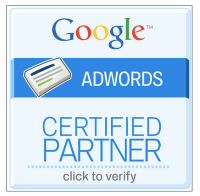 I did and received this morning an email confirming my status as a Google AdWords Certified Partner.